A bicameral parliament, with an upper house, the House of Lords, and a lower house, the House of Commons, the Parliament of Great Britain is the supreme legislative body in the United Kingdom. When the Founding Fathers of America worked to construct the government, they looked to British Parliament for structure, creating the Senate (comparable to the House of Lords) as the province of ostensibly unbiased wealthy elites, and the House of Representatives (like the House of Commons), as the voice of the people. However, the British Parliament didn’t achieve relative equality with the House of Lords until the mid-19th century, until after the reforms of the 19th century, when, beginning with the Reform Act of 1832, the electoral system in the lower House was much more regularized. Freed from corruption of “rotten boroughs” and antiquated electoral systems, members of the House of Commons, no longer dependent on the upper House for their seats, began to grow more assertive. 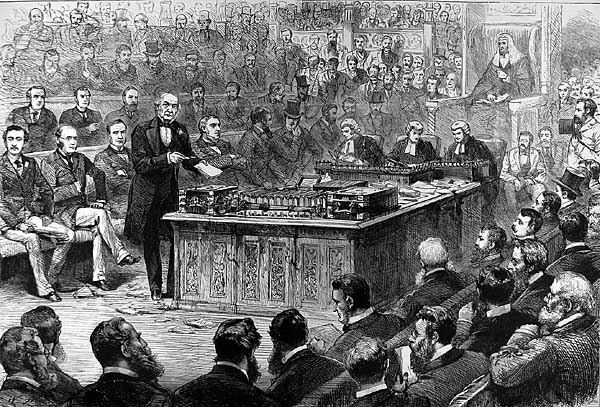 A popular maxim of the 1830s to 1860s was “the House is the best club in London.” Prior to the Third Reform Act of 1884, it could be said the House of Commons was akin to a traditional gentleman’s club, being filled with gentlemen of means and of gentle birth. In that year, the franchise was given to the laborers in the country, and constituencies were subdivided in view of a redistribution of seats throughout the country in order that electors in every locality might make their wishes more immediately and directly felt. Another law fixed the maximum expense of a candidate to £700 in boroughs to £1800-2000 in counties, leading many to predict a deterioration in the quality of Members and in the personnel of the House. 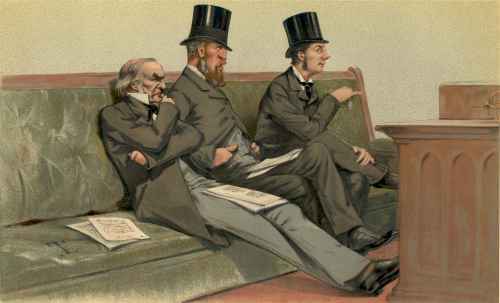 Nonetheless, there had been a gradual lessening of social exclusiveness apparent at the general parliamentary as well as at the cabinet level since the mid-19th century, with a steady decline in the number of MPs drawn from the aristocratic and landed interest (fewer than a quarter of the total by 1900) and a corresponding increase in middle- and upper-middle-class MPs with incomes derived from industry, finance or the professions. Solicitors and barristers were the largest single professional group in the 1906 parliament, but also remarkable after 1906, was the substantial rise in the number of working-class MPs, accounted for largely by the success of the Labour Party during that year’s General Election. By law, the life of the House of Commons was limited by law to seven years. In practice it rarely extended much beyond four. 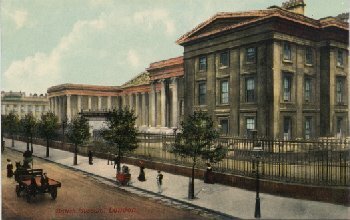 Until 1911, when a formal salary of £400 a year was introduced, Members of Parliament did not receive a salary or allowance of any kind from public funds, and were not granted any traveling expenses unless they held a Cabinet office. Each member represented about 10,000 electors, who in their turn represented about 100,000 of the population. Whenever the births exceeded deaths, leading to over-representation of some and the under-representation of others, a Redistribution Act became necessary every 20 or 25 years. 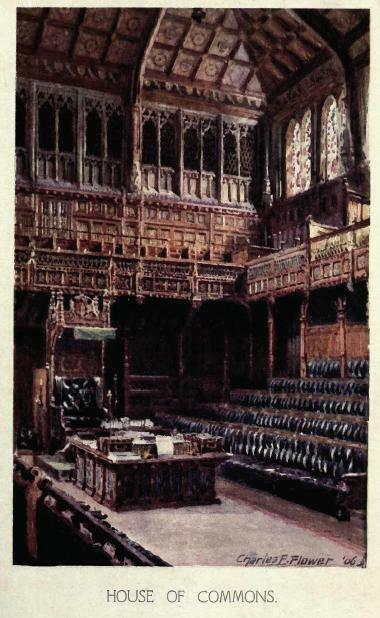 Except on Wednesdays, when it met at noon, or when special forenoon sittings were ordered on Tuesdays and Fridays, when it met at two, or on occasional Saturdays at the end of the Session when there was no set hour for either beginning or ending–the House of Commons met at a quarter to four. The first business accomplished is the brief religious service conducted by the chaplain during which the doors to the Commons were closed to the public; as soon as they ended, strangers were admitted into the galleries. After this, members proceeded with Public Business after dealing with Private Business, which, except by resolution of the House, had to be commenced before half past four. This rule however, only held good until Easter, after which Private Business was reduced to fifteen minutes. 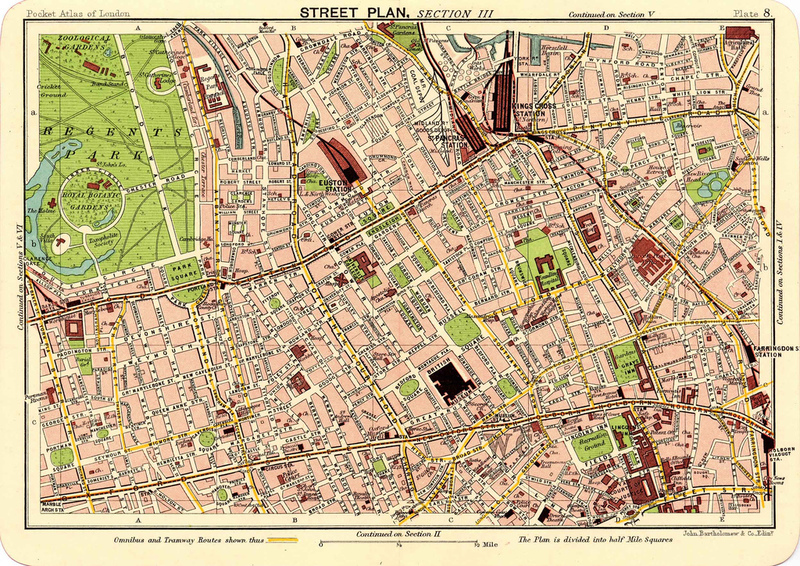 The term “private business” meant all Bills promoted by railway companies, gas companies, water company, municipal corporations or private individuals, and all measures of a purely local character. Despite photographs and other renderings, the chambers belonging to the House of Commons were small, allowing no more than 430 seats–those in the galleries included! As such, there was a distinct difficulty in seating 670 gentlemen, who were in constant attendance throughout a Session of six months. As there are not 670 seats in the chamber, it was essential to create a self-adjusting rule, and this was done by the promulgation of the simple decree that members who desired to secure a seat for the evening could do so by being in attendance at prayertime. To this end, a small brass slide was been affixed to the back of each seat and cards were provided on which a member could write his name and secure that particular seat. This done, the seat was secured for the rest of the night. Nearly every member of the Commons had his particular seat, but none except the Ministers and ex-Ministers had a right to continue to use that seat. No doubt that during rousing, controversial debates, such as those held during the height of the struggle for Home Rule, the Commons was packed to the brim with MPs, ladies, and journalists swept away in the excitement of it all.